My work is rooted in the Hauser instrument-building tradition. Over the years I have added many refinements, including sandwich or doubletop construction for the soundboard. 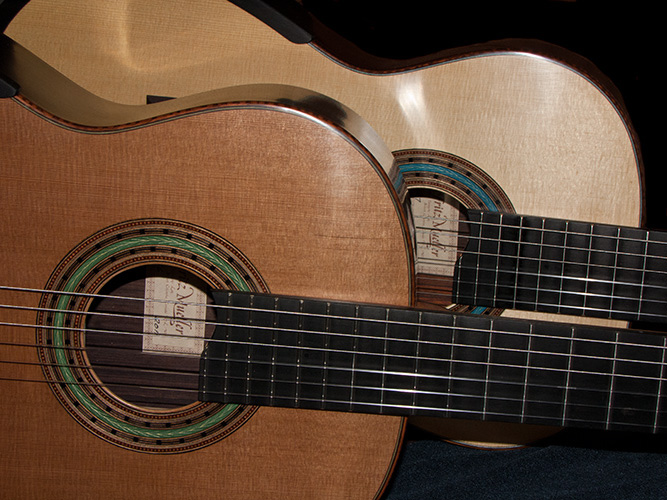 These are true concert guitars, with an exciting, magical sound that is a joy to play. Volume: a broad dynamic range. The sound stays clear and focused at all dynamic levels, even the loudest - a sound you can "push" without distortion. Projection: a carrying sound with a strong fundamental that gets to the back of the hall. Even when you play softly, the sound gets out there. Strong, singing trebles: a "fat", sustaining, satisfying sound. Deep, full bass: adds great richness throughout the range of the instrument; clear and well-defined at all dynamic levels. Exceptional evenness and balance: every note is strong and clear. Across and along the strings - all the notes are there, at all dynamic levels. Great clarity and separation - notes are distinct and audible in the chords. Timbre: Lots of color and variation, from silky smooth to warm and sweet to hard and crisp to gutsy. A strong, sustaining sound. Notes hold steadily without wavering. Beauty of sound - beautiful, expressive, bell-like sound - a truly musical sound. Designed to fit your hand and playing style: custom neck profile, string spacing, and action height. 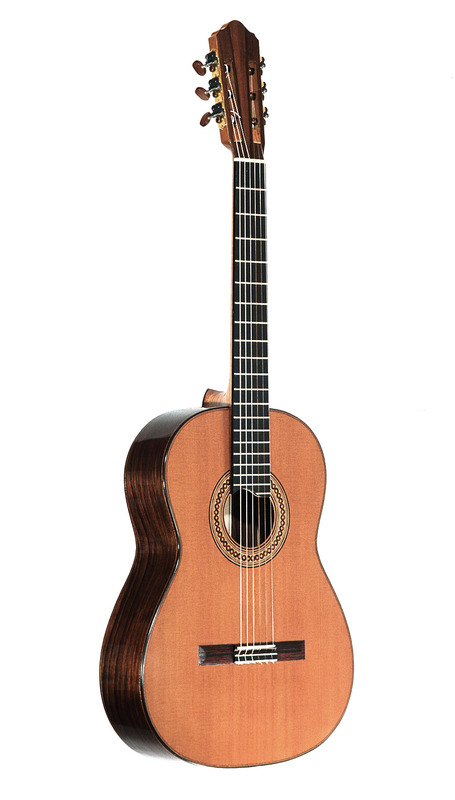 Easy to play: comfortable, ergonomic neck and fingerboard ease barreing and those long left-hand stretches. Elevated fingerboard aids playing above 12th fret. Amount of elevation can be customized to fit your needs. Extremely responsive to the right hand: light construction creates an expressive instrument. 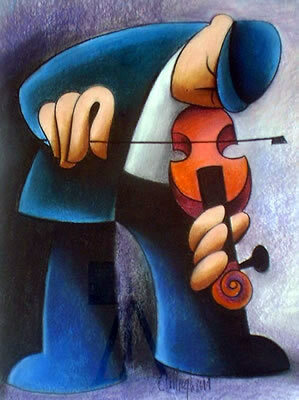 You feel the instrument vibrate. It's exciting to play - a living thing in your hands. Built with the finest instrument woods - beautiful pieces of wood with superb tap tones - all well-quartered and seasoned many years. Traditional and non-traditional woods are available. For the soundboard: Western Red Cedar, Engelmann Spruce, and European Spruce. For back and sides: Indian Rosewood, Ziricote, Macassar ebony, Bigleaf and European Maple, Indian Laurel, Spanish and New World Cypress, Mango, Padauk, and others. Of special interest is BC Engelmann spruce, a hard, light, stiff, extremely resonant topwood that equals or surpasses the best European spruce in quality. All instruments feature doubletop construction of the soundboard. See the essay on doubletops elsewhere on this site. The outer skin can be either spruce or cedar; the inner skin is most often cedar. 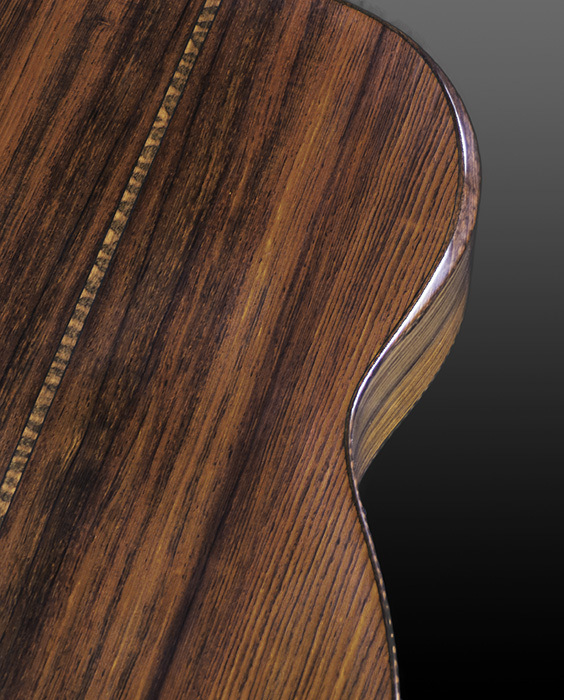 Note that, due to their endangered status, I no longer offer Brazilian Rosewood, Madagascar Rosewood, Cocobolo, or African Blackwood for back and sides. Indian Rosewood has also recently been CITES-listed. I still have a good stock of pre-convention Indian Rosewood, but please consider an alternative. There are many other highly suitable woods for back and sides that are not endangered. 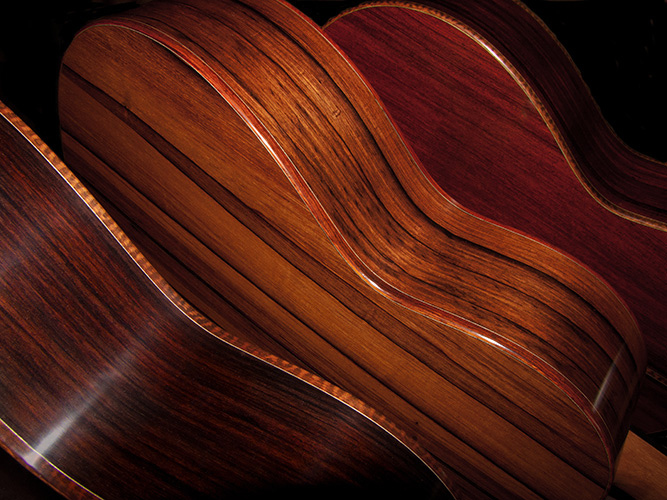 Indian Laurel's appearance and tonal qualities, for example, closely match those of Indian Rosewood. 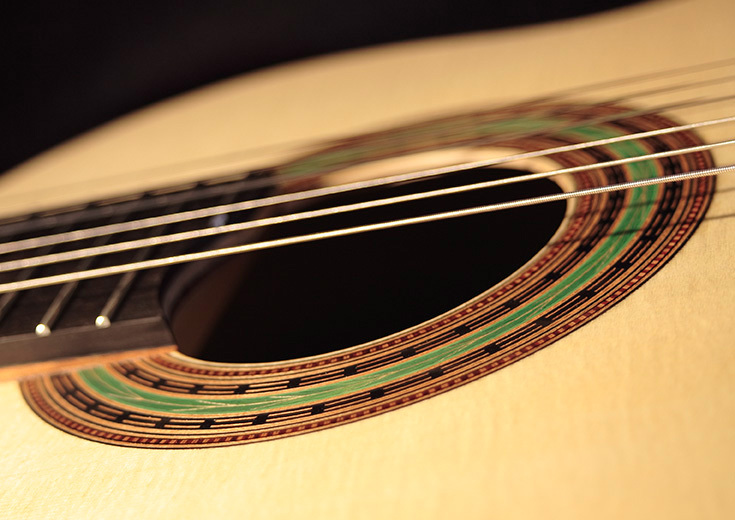 The soundboards of my standard instruments are carefully finished with French-polished shellac - a beautiful, traditional finish and possibly the best finish acoustically. Back and sides can also be finished with French-polished shellac, but for greater durability, I usually employ a lacquer finish for back and sides. French-polished shellac is available for those who wish the most traditional finish and do not mind the extra care required. Bridges and fingerboards are finished with oil. Oil finish for the neck is standard. Tuners: Sloane tuners are standard on all instruments (March, 2018: I am researching an alternative to Sloane's. Please contact me for details.) Upgrades to Rodgers and other high-quality tuners are available. Case: A Hiscox Pro hardshell case is included in the base price. Upgrades to Hiscox Artist cases are available. "...A BEAUTIFUL NATURAL SOUND, A STRONG OPEN VOICE, CLEAR FIRST STRING, DEEP BASSES BUT NOT MUDDY, AND A LOT OF RICH HARMONICS." "...A VOICE OF THE ANGELS."